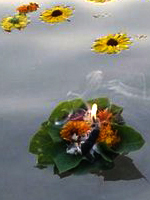 Ganga has been a symbol of India's age-old culture and civilization, everchanging, everflowing, yet the same Ganga. - Pt. Jawaharlal Nehru, Prime Minister of India (Will and Testament). 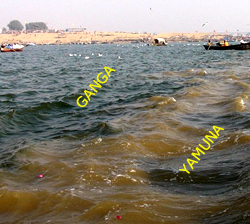 The River Ganga has been the cradle of Indian civilization and symbol of purity to millions. It is treated as one of the most holy rivers of the world. The Ganga is the largest river of the Indian sub-continent. The Ganga-Brahmaputra-Meghna river basin covers only 0.12% of the total landmass of the Earth yet about 10% of the world's population reside there. It serves the needs of more than 400 million populations. The Ganges is regarded by Hindus as the most sacred river in the world. Many important religious ceremonies are held in cities on its banks, including Varanasi, Haridwar, and Allahabad. The ganges is a source of divine purification for Hindus who travel by the millions every year to bathe in its waters and to submerge the cremated remains of their dead. Don't investigate the origins of either a river, or a rishi. The idea is you should not judge a great soul by his parentage, or a river by its source. But the mighty Ganges is great on several counts, including its origin. The sources of this holy river are the pristine, icy glaciers of the Himalayas. The origin of river Ganges lies at the height of 13,800 feet in the mountain ranges of Himalayas, near Gangotri. 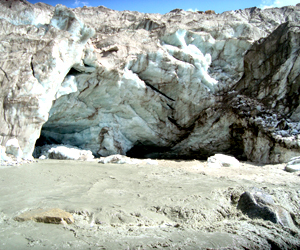 It emerges from an ice cave in the Himalayas at the altitude 10,300 feet. 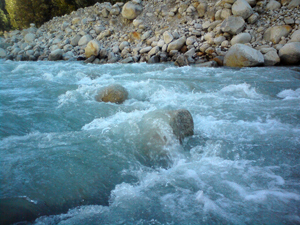 The place, where Bhagirathi flows out from Gangotri, is called Goumukh, which means Cow mouth. With bit of imagination this icy cave can remind you a face cow. Gangotri is the place of origin of the Majestic Ganges river, known to hindu's as Ganga Maa (Mother Ganges). The supream amongst Indian rivers, is the longest river and greatest waterway in India. The Ganges has been declared as India's National River. Ganges is the source of sustainment of life in the great Indian plains and it is at Gangotri that the journey begins. River Ganges gets water from the melting snow of Nanda devi, Gurla, Mandhata, Dhaulagiri, Gesaisthan, Kanchenjunga and Mount Everest. Many small and big rivers merge with the Ganges in the Himalayan region. The Ganges river flows through Bangladesh, but the greater part of it flows through India. The river flows across the northern corner of India. The Ganges flows across India and Bangladesh until it empties out into the Bay of Bengal. The great river provides water to many places, and many places rely on it. According to the Hindu mythology, the ruler of Ayodhya, a Suryavanshi King Sagar, an ancestor of Rama, magically acquired 60,000 sons. In those days, kings would perform Ashwamedha Yagya or horse sacrifice. After a long ritual of worship, a horse would be left free to wander, protected and followed by soldiers. The ruler of which-ever country the horse goes to either accedes to the hegemony of the king who sends the horse and pays tributes to him, or contests his supremacy by fighting his soldiers. When the horse returns back unchallenged, the king establishes his suzerainty over the neighboring kingdoms. King Sagar decides to perform the Ashwasmedha Yagya and sends his horse across the earth accompanied by his sons. The Rain God, Indra (king of heavans) doesn't like the growing power of King Sagar, and he steals the horse and hides it at Sage Kapil's ashram. King Sagar's men go in search of the horse and finding it at Kapil's ashram, mount an attack. The din wakes the meditating sage and his angry stare reduces all the princes to ashes. Anshuman, a grandson of King Sagara, comes to Kapila begging him to redeem the souls of Sagara's sons. Kapila replies that they'd be redeemed only if the Ganges descends from the heaven and touches the ashes of the princes. 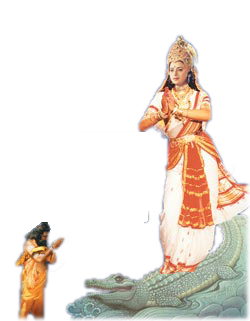 Finally, King Bhagiratha, Anshuman's grandson does very hard penance by standing on single leg for several years. So intense was this penance that even today when somebody makes superhuman efforts, we call it Bhagirath Prayatna, or Bhagirath's efforts. Ganga is pleased with Bhagirath's single minded dedication and descends to the earth. Shiva receives the heavy downpour on his matted locks and releases it forth from his locks in seven streams. These streams followed a threefold course, three flew towards east, three flew towards the west and and the seventh stream followed the route, as instructed by Bhagiratha, and hence was called Bhagirathi. Ultimately all the sixty thousand sons of Sagar were liberated by the sprinkle of the water of the Ganga. Since then Ganga is sanctifying the mankind with her divine waters. The seven streams are Bhagirathi, Janhvi, Bhilangana, Mandakini, Rishiganga, Saraswati and Alaknanda which merge into Ganga at Devprayag. Ganges (Hindi Ganga), major river of the Indian subcontinent, formed in the Himalaya, in Uttarakhand State, India. The Ganges mostly flows in India, except Bangladesh before emptying into the Bay of Bengal. The Ganges Basin, one of the most fertile regions of the world and also one of the most densely populated, lies between the Himalaya and the Vindhyachal Range, and embraces an area of more than 1 million km2 (386,100 mile2). The Ganges, about 2,510km (1,560 mile) long, emerges in a snowfield called The Gangotri Glacier, situated among three Himalayan mountains all more than 6,706m (22,000 ft) high. It starts as the Bhagirathi River from an ice cave, 3,139m (10,300 ft) above sea level, and falls 67 mts./km (350 ft/mile). About 16 km (10 mile) from the source is Gangotri, the first temple on its banks and a traditional resort of pilgrims. At Devaprayag, 214 km (133 mile) from the source, the Bhagirathi joins the Alaknanda to form the Ganges. The Ganges enters the plain from Rishikesh after completing a journey of 229 kms. (142 miles) in a rugged tarrain of Himalayas. The Ganges, after descending 2,810m (9,276 ft), or an average of about 11 mts/km (60 ft/mile), flows west to the border of the great plain of India at Haridwar, 253 km (157 mile) from its source and ,312mts (1,024 ft) above sea level. From Haridwar it continues south and then south-east to Allahabad after a winding course of 785 km (488 mile), made unnavigable by shoals and rapids. At Allahabad, the Ganges is joined by the Yamuna River from the south-west, and from that point the river flows east past Mirzapur, Varanasi, Ghazipur, Patna, Monghyr, and Bhagalpur, receiving on the south the Son River and on the north the Gumti, Ghaghara, Gandak, and Kosi rivers. In the Rajmahal Hills, at the head of the Ganges delta, 906 km (563 mile) from Allahabad, the river turns south and begins a descent of 455km (283 mile) to the Bay of Bengal. Near Pakaur, the Bhagirathi (assuming the former name of the river) and, 114 km (71 mile) lower down, the Jalangi River branch off from the main stream, and after individual courses of 193 km (120 mile) each, unite again to form the Hooghly River, the westernmost and principal channel of navigation, on which the city of Calcutta stands. The main branch of the Ganges, from which numerous minor tributaries flow, continues in Bangladesh, as the Padma River, to the town of Shivalaya (Sibalay), where it unites with the Jamuna, the main branch of the Brahmaputra, and finally runs through the Meghna estuary into the Bay of Bengal. Between the Meghna estuary and the western channel of the Hooghly River are the several mouths of the deltaic channels. The northern portion of the delta is fertile and well cultivated. The southern section consists mostly of swampland, known as the Sundarbans, because of the sundari tree that flourishes there. The marshes are inhabited by several species of crocodile. From year to year the Ganges exchanges old channels for new ones, particularly in the alluvial basin of its lower reaches. Like the Brahmaputra, the Ganges has been adversely affected by the deforestation of valleys in its upper course, causing flooding and an increase in sedimentation around the river's delta in Bangladesh. This sometimes combines with coastal flooding caused by cyclones to produce inundation of the delta area on a massive scale. 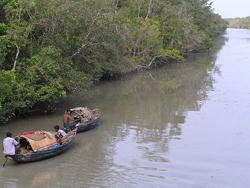 The Sundarbans are a part of the world's largest delta formed by the rivers Ganges, Brahmaputra and Meghna. The whole tract reaches inland for 100-130 km. (60-80 miles). It is dominated by mangrove forests and gets its name from the Sundari (Heritiera foams) trees. Situated at the mouths of the Ganges, Sunderban spreads over 54 islands and two countries (India and Bangladesh) and is part of the world's largest delta region. Sunderban covers an area of 4262 kms2 in India. The Sunderban Tiger Project was started in 1974 and has an area of 2585 kms2. The core area is 1330 kms2 and is a national forest and UNESCO world heritage site. 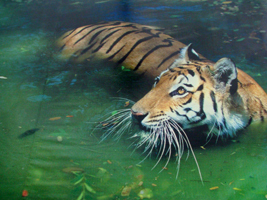 Sunderban is home to the largest number of wild Tigers in the world. When the Goddess Ganga, according to Hindu mythology, came down to Earth from the skies, the dolphin was amongst the creatures that heralded the descent of the holy river. Today, the Ganga river dolphin, which was one of the world's first protected species, given special status under the reign of Emperor Ashoka, is crying for its existence. The Ganga river dolphin is an extremely valuable species for monitoring the aquatic environment. It acts as an indicator of health for the ecosystem of the river system. Being at the top of the food chain, its presence in adequate numbers signifies a rich biodiversity within the river system. But the IUCN's (World Conservation Union) red list of threatened animals has recently changed the status of this species from vulnerable to endangered. 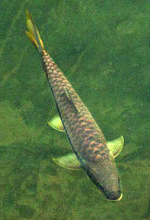 The undisputed king of the Himalayan rivers is the Mahseer. A large, powerful fish, it is the largest member of the carp family in the world. Mahseer means Great mouth in India, an apt name for the long slim creature known to be the toughest fighter amongst fresh water sports fish. Eco System of Ganges is very suitable for habitat of Himalayan Golden Mahseer. One can see many schools of these creature in and around Rishikesh. One can find abandance of these creatures at the places where fishing is prohibited by law such as Triveni Ghat, Ram Jhula and Laxman Jhula. It is definately a treat to feed them from the centre of Ram Jhula and Laxman Jhula in summers and winters when water is crystal clear. Fish feeding generates employment for poor people who sale feed for them. Like all other wild creatures, the Mahseer has suffered the effects of environmental degradation and river pollution for decades now and the result has been not only a drastic decline in numbers, but in average size as well. Especially the Ganges river system, pollution has reached alarming levels primarily due to the fact that the Indo-gangetic plain is home to a population of some 300 million plus. The extensive use of dynamite for fishing in the Himalayan areas has been another factor contributing to a decline in their numbers. A pursuit mainly of road labour gangs, it consists of tying a stick of dynamite to a stone and throwing it into the water. The resultant blast and concussion brings many fish belly up and these can then be gathered in. However, since most these dynamite fishermen lack nets and the Himalayan waters are fast flowing, the end result is that they manage to grab only a few fish for the dozens they kill and maim.